NOVEL IDEAS: The head writer for ImprovBoston, Alterman draws on her experiences in the entertainment industry for her fiction, including her second novel due out this year. Slowing down seems like the last thing the former Rochester film and media studies major is interested in. In the five years since graduation, she’s done more in the entertainment business than several professionals put together. 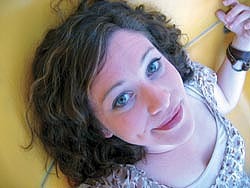 After working as a production assistant (and a waitress, to make ends meet) and spending a year studying with Second City, she now is head writer for the comedy troupe ImprovBoston, writes for the online magazine and filmmaker site NewEnglandFilm.com, and has completed her second novel. Asked to name her profession, she describes herself as “author/comedy writer/ film journalist/tired.” (“I don’t sleep a lot, but that’s okay,” she says.) Although she didn’t plan it, Alterman considers herself an author first and foremost. That first novel, My 15 Minutes, which was published last September, is the story of a Los Angeles waitress who accidentally becomes the average-girl “girlfriend” of a heartthrob movie star—a pairing concocted by the star’s agent. Her second, Tears of a Class Clown, which will be released this September, features a main character who’s very funny but makes a living as a bartender because her paralyzing stage fright keeps her from pursuing a career in comedy. Alterman admits that both novels have autobiographical elements, drawing on her experiences in food services and in the entertainment industry. Being a performer was part of her plans when she began college at Sarah Lawrence, where she spent her freshman year as a voice major. Once she realized that the highly competitive artistic scene there took the fun out of singing for her, she transferred to Rochester, where the arts were alive and well, just less competitive—more comfortably so, says Alterman. And at Rochester she discovered a way to enjoy singing again, helping to found the a cappella group After Hours. These days, however, she views singing as a hobby, and she spends most of her time at a keyboard. In addition to her journalism and comedy writing, she’s working on her third novel, which she describes as a female Walter Mitty tale. Alterman’s books fall into the pop culture catchall of “chick lit”—those candy-colored trade paperbacks by and about young, hip women—and she doesn’t mind the label. She says that My 15 Minutes is being shopped around to studios, and the book has generated some interest, although there are no firm plans yet. In the meantime, she says, “I’m happy with seeing my name on a book cover.